To see who your Account Owner is, check your User list within your Hotjar dashboard. This will transfer ownership of the Organization and any Sites it contains. The user you are transferring ownership to has access to the Organization you would like to transfer. All Sites under the Organization are downgraded to our free Hotjar Basic plan. You can downgrade the site on your Plans & Billing page. Go to Settings and select Sites & Organizations. 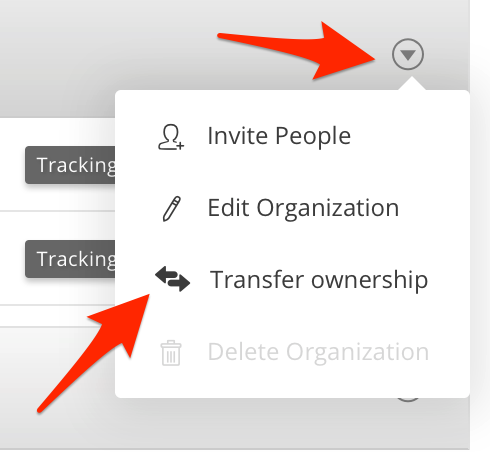 Click the drop-down arrow on the transferring Organization. Choose the user you would like to transfer ownership to from the dropdown. Confirm your password and select Transfer. No data will be deleted or lost during the transfer process. Reach back out to Support and we will transfer the Organization to the new account. No data will be deleted or lost during the transfer process. The new account owner can then upgrade the Plan, add users, etc. You will not have a conventional ‘account’ within Hotjar, as described above. Please contact support if you believe this is the case, so we can update your user type. Once this is done, follow the steps for Transferring Organizations to a Different Hotjar Account along with the current Account Owner.